Hang tag printing allows your product to stand out from the rest. People judge a product primarily by its label. To rise in a sea of similar merchandise, your product needs to be distinctive and beautiful at the same time. This is where metallic bottle neck hang tags come in. Think of bottle neck hang tags as bow ties for your product. They put a touch of class to your bottled merchandise regardless of its kind or price point. Whether you're selling fine wine, craft beer, or sparkling water, these custom hang tags can take your product design from bland to brilliant. Drape these over your bottled goods to capture the attention of more customers and bring in more sales. What Can You Do With Bottle Hang Tags? Metallic bottle neck hang tags feature beautiful light-reflecting accents, thanks to the silver foil layers. These personalized tags are printed on durable 16 pt. cardstock, which serves as a stiff and tear-resistant canvas for your promotional content. 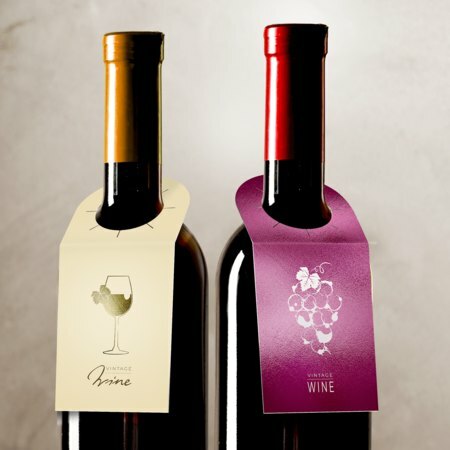 Versatile and reusable, custom hang tags can complement your bottle label design. Add product specs, discount codes, and even cocktail recipes to your hang tags.